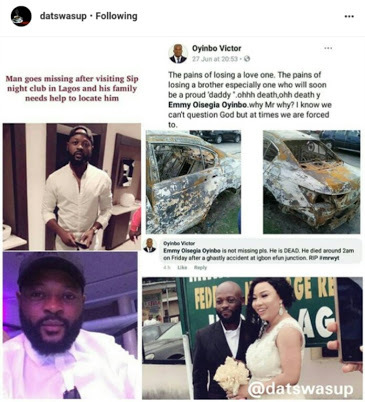 Emmy Oyingbo fondly called Mr. White by friends, who got married to a beautiful wife late last year has been announced dead. Recall that Mr Emmanuel was declared missing a few days ago, after visiting Sip night club in Lagos. 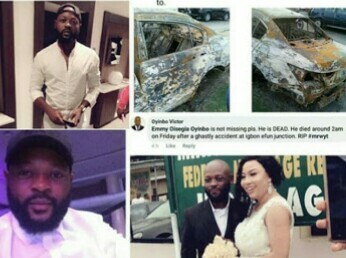 His car has been found, completely burnt in an "accident". Mr Emmanuel's wife is pregnant with his first child. He will be buried on Friday at the Yaba cemetery, Lagos. The pains of losing a love one. The pains of losing a brother especially one he Vicki will soon be a proud 'daddy'. ohhh death, ohh death y Emmy Oisegia Oyinbo. why Mr why? I know we can't question God but at times we are forced to.